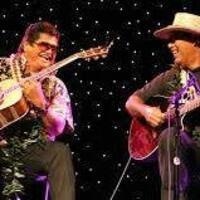 Led Kaapana & Mike Kaawa are masters of the distinctly Hawaiian style of music known as slack key guitar (Kī-hō’alu). Led Kaapana is one of the best slack key players alive today. He has a style that comes from his family in the days before TV, radio, internet — it’s down-home and real. His finger-pickin’ style extends to ‘ukulele – he just won the Na Hoku Award for Best ‘Ukulele – and to autoharp, and his vocal range encompasses baritone to Hawaiian falsetto singing (leo ki’e ki’e). Recognition by his peers earned Led four Grammy nominations in his own right and three Grammy wins on slack key compilations. A musical legend, he was honored with an NEA National Heritage Fellowship in 2011. Led is joined by longtime collaborator Mike Kaawa, Hawai’i’s finest 12-string guitar player and one of its most highly regarded musicians. Known as “The Hawaiian Boy”, he describes his music as “Hawaiian with attitude”. Mike Kaawa is the perfect match for Led. Since they began performing together in the early 2000s, they have crafted a remarkable musical rapport much like jazz musicians’ improvisations with each other. The Palms generally hosts live music Thursday-Saturday evenings, with occasional shows on other nights of the week. Doors open a half-hour before showtime. We are located upstairs in the Winters Opera House building at 13 Main Street, in between The Scoop frozen yogurt shop and Cloth Carousel. Our bar has a rotating menu of local craft beers and wines, sodas, tea and locally roasted coffee (from The Pepper Peddler in Davis), and light snacks.